Title: BNSF 6381 rolls south as a rear DPU with BNSF 6383 behind her as they push a loaded coal train. Description: A pair of BNSF GEVO's lead a loaded train bound for Plant Scherer at Juliette, GA. Description: Eastbound OGEX loads east of Ellsworth on the Ravenna sub. Description: NS manifest 186 surprised us this evening, seen passing through Shawsville with a pair of BNSF AC traction units. Description: A pair of BNSF AC traction units lead manifest 186 east through Elliston as storms begin to form. Description: BNSF 6381 leads 2 other Gevos on this empty CEFX coal train just outside of Foley, Mo. I believe this is a re-routed train. Title: BNSF 6381 Leads a coal Nb. Description: 3 gevo's take charge on this empty coal train this train would set out a car At clarksville Mo. 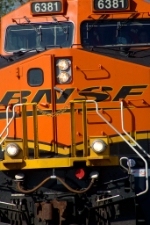 Title: BNSF 5883 Slows to a stop. Description: The crew would half to get off and hand throw the switch just to the right of the photo.